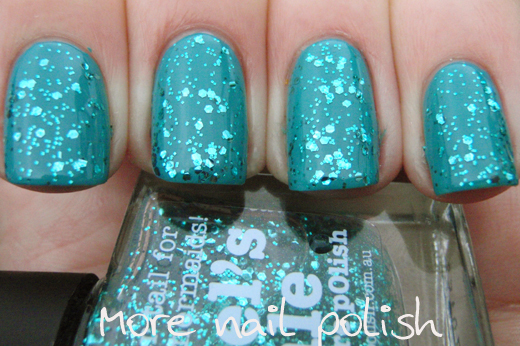 Today I have the five new glitter polishes from piCture pOlish to share with you. Three of them are single colour glitters and the other two are multicoloured. Let's get straight to the swatches. Details on formula etc at the bottom. 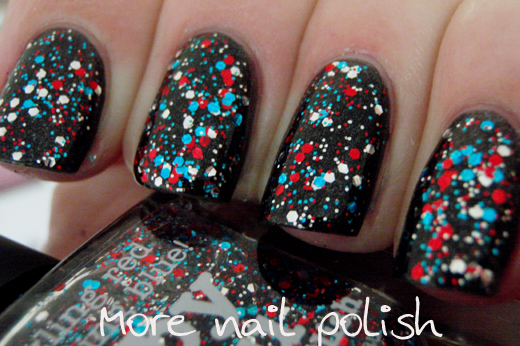 Ariel's Tale - two coats layered of Picture Polish Marine. 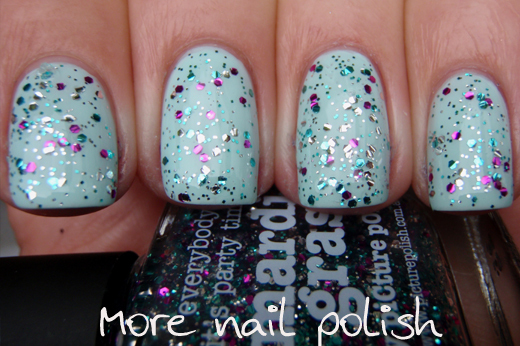 This one has small square and medium sized hex, aqua green glitters. 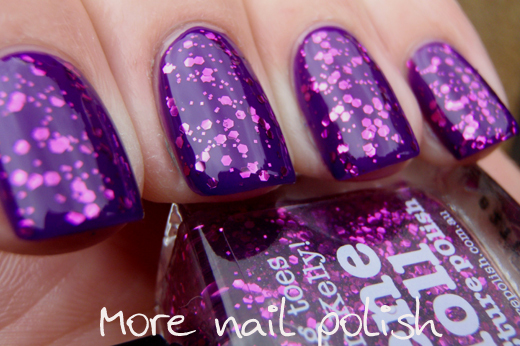 Gene Doll - Two coats layered over Picture Polish Violet Femme. 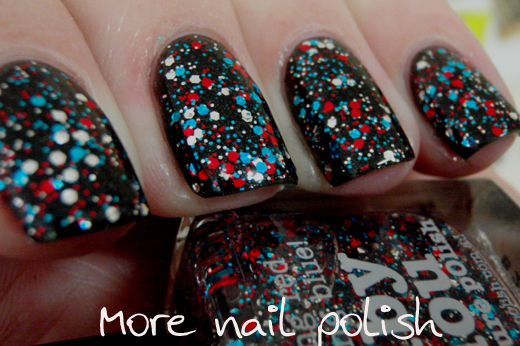 I just loved this combo, these two polishes were made for each other. Gene doll has small and medium sized fuchsia pink hexes. Mardi Gras - Two coats layered over Picture Polish Sky. This one has small silver hexes and small aqua squares as wells as medium sized hexes in silver, aqua and fuchsia. 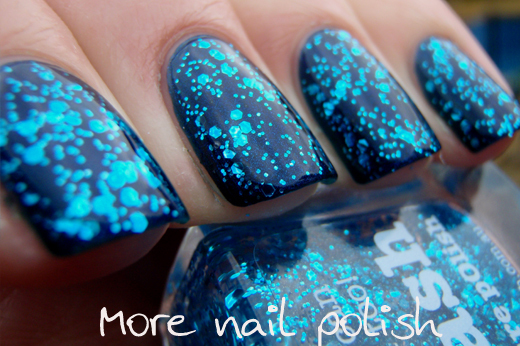 Splash - Two coats layered over Picture Polish Electric Blue. Bright blue small and medium sized hexes. The formula on all these was excellent They are definitely glitter top coats rather than polishes you could built up to opacity. They dried very glossy and smooth for a glitter and only needed a single layer of top coat. Drying time was normal. I did notice some very slight reflective curling on the silver and aqua glitters in Mardi Gras and the silver, red and blue glitters in Ruby Blou. I found that odd, because it appears to be the same blue glitter in both Ruby Blou and Splash, but there are no curls in splash. I also didn't notice any curls in Ariel's Tale, but they look like the same aqua hexes is Mardi Gras. No sign of curls on Gene Doll. Go figure. Anyway, as you can see, these all were glossy and smooth with just one layer of top coat. But I thought I'd mention it, as I know you eagle eyed girls would pick it up! 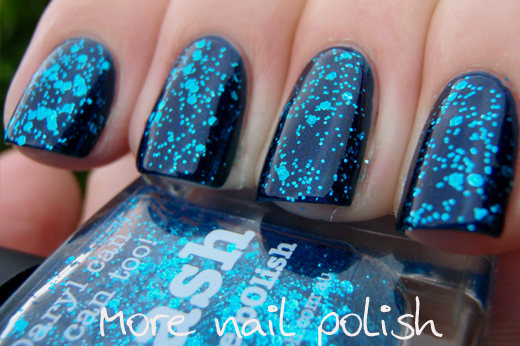 The only polish that is similar to any of the new Ulta3 glitters is Splash. 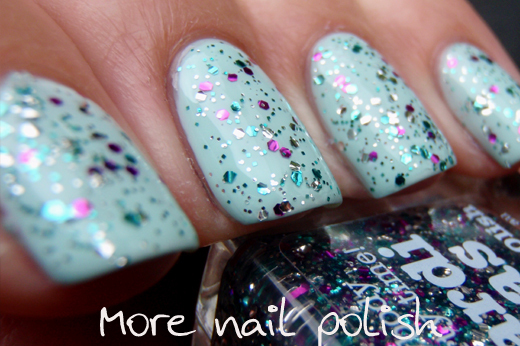 Although the shade of blue glitter is very slightly different, and the Ulta3 polish has three sizes of glitter and a higher glitter per wipe ratio. I really like this collection, they are simple and fun. I think my favorite would be Gene Doll, which is so very unlike me to choose a fuchsia glitter. Maybe it's just the colour combo that smacked me in the face. Which is your favourite? Wow!! Ruby Blou really pops against the darker background! Love these combinations! Stunning! Really love these! Have an urge to matify the first one, for some reason. beautiful! want all of these! i'm in love with splash and gene doll! 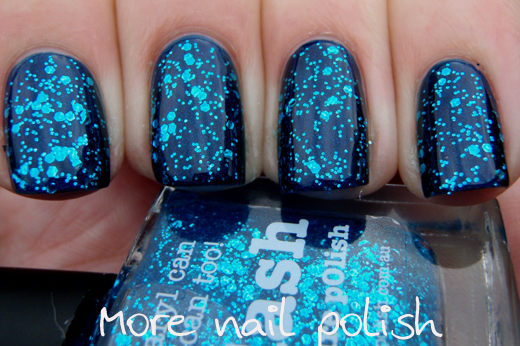 I am addicted to glitter polish and must find Gene Doll and Splash here in the states. Secondly what nail stamping system do you use? 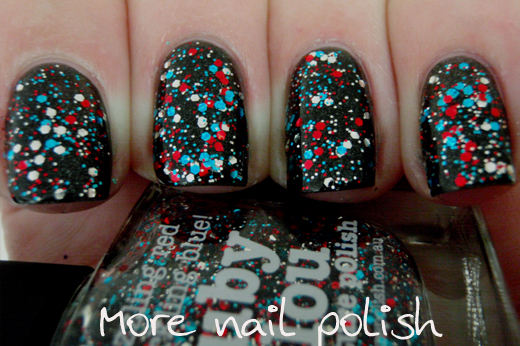 I need to get one to further my polish addiction and to further frustrate the hubby. I like the looks of your stamps. Oh NO...These are gorgeous! I want them...hence the oh no! !Stunning swatches as always! I love Gene Doll, but all of these are gorgeous! I love your manicure with Mardi Gras, also. Very nice! Wow really stunning. Love all of them.